Sideways icicles from December’s ice storm. 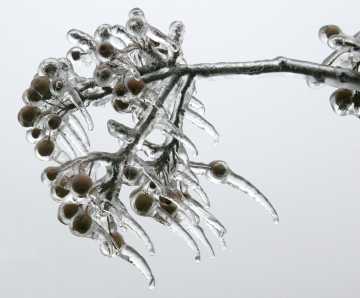 Strong winds blowing water from freezing rain made these icicles form sideways on a crabapple tree at Gilmore Pond. Here we are in the depth of another old-fashioned winter, full of ice and snow. The old-time Native American name for January’s full moon, the Wolf Moon, conjures up images of hungry wild predators that no longer roam our local landscape. But like people in the past, we can comfort ourselves on these frigid days by looking forward to what the natural world will offer in the year ahead. Amuse yourself and jog your memory for local plants and animals by taking our annual Nature Notes quiz. For extra fun, do the quiz as a family, science class, scout troop or other group. Below you'll find a list of short descriptions from Nature Notes columns published in the News in 2008. Match these descriptions with names from the list of possible answers that follows. If all – or almost all – of your answers are correct, email your name or your group’s name to us at NatureNotes@westboroughlandtrust.org . We'll publish the names of top scorers in a future issue of the Westborough News. 1. This woody vine is invasive but picturesque in the fall, and you’ll often find it along “edges” where open areas meet woodlands. 2. These popular, colorful birds sometimes remain in our area throughout the winter, with two to 20 of them huddling together for warmth in a tree hole on cold nights. 3. These tiny creatures swim upside-down, have eyes on stalks and appear “like magic” in our vernal pools in early spring. 4. This naturalized wildflower has yellow blossoms and yellow sap that people used to put on warts to remove them, giving it the old name “wartwort” (with “wort” being an old word for “plant”). 5. Mark your calendar: We’ll see the next one of these in the sky in late December 2009. 6. People are often afraid of these creatures, which are harmless to humans. 7. These wild ducks are the ones that you’re most likely to see in Westborough because they are fairly tolerant of humans. 8. They feast on poison ivy berries and bayberries in the fall because their digestive systems are specialized to digest wax. 9. These small, delicately patterned, orange-and-black butterflies are common from mid-May to mid-September, and they come from caterpillars that feed on asters. 10. Like other damselflies, this one holds its black wings upright above its body when it lands (in contrast to dragonflies which hold their out wings to the side like an airplane). 11. This sturdy dragonfly is known for migrating south in the fall and back north in the spring. 12. This “species of special concern” (SC) in Massachusetts breeds only in vernal pools and can grow a new tail if a predator gets the original one. 13. This small plant grows under pine trees and is never green, but it gets the nutrients it needs by tapping into the partnership between underground fungi and tree roots. 14. A pair of these fish-eating birds of prey usually nests in the middle of Mill Pond. 15. Native Americans flavored meats with this plant and also made a tea from it to soothe upset stomachs, colds, fevers, and sore throats. 16. This creature lives in pine and spruce trees and is sometimes credited with the discovery of maple syrup. 17. Air spaces help it to float. 18. This wildflower is built on a plan of threes, with three white petals and three leaves. 19. These bright yellow songbirds migrate here from Central or South America to nest in shrubby areas near water in May or June. 20. In bygone days, this native weed was commonly brewed as a bad-tasting tea to treat colds, fevers, and even the pain of broken bones. 21. These early spring wildflowers bloom in the woods before the trees leaf out, opening during the daytime and closing at night. 22. These brightly colored salamanders wander safely on land in daytime because their skin is poisonous to most predators. Go to Answer Key on page 15.